Powers/Abilities: The capabilities of the new Porcupine armor remain unknown as it has only been demonstrated to fire sharp quills from its form. Previous incarnations of this armor have come equipped with capabilities of firing various types of gas, bombs, and other discharges, enhanced strength, and with jets capable of short flight. (Spider-Woman V#9 (fb)) - As a child, Roger Gocking wanted to grow up to be a sheriff. (Spider-Woman VI#5 (fb) - BTS) - After the birth of Kalie, Roger Gocking stayed home to raise her while Olivia worked. He grew to love being a parent. (Sensational She-Hulk#59) - Someone wearing Gentry's Porcupine costume battled She-Hulk in a courtroom where she was suing the Tinkerer. The identity of this person was unknown. (Spider-Woman VI#15 (fb) - BTS) - After a stint in Ryker's Island, Roger Gocking signed a contract with Hobgoblin (Roderick Kingsley), buying the rights to a new Porcupine identity and beginning a career as a costumed criminal. (Spider-Woman VI#14 (fb) - BTS) - Olivia required Roger to choose between his family or his pursuits as Porcupine; she left him when he chose his criminal career. (Daughters of the Dragon#3) - While at a bar, Porcupine and other villains were attacked by Colleen Wing and Misty Knight, who were seeking information. Porcupine was quickly felled and thrown into Doctor Bong. (Thunderbolts II#104) - Members of the Thunderbolts army, MACH-IV and three operators of his prior Beetle armors, attacked Eel (Edward Lavell) and the new Porcupine in San Francisco. The operator of the tank Beetle armor bowled Porcupine over. They were returned to Baron Zemo's interspatial headquarters, then inducted into the Thunderbolts army in Desert Flats, New Mexico, to train, their only other option being jail. (Thunderbolts II#107) - Porcupine fought alongside Boomerang, Doctor Octopus, Eel, Quicksand, Unicorn, Whirlwind (David Cannon), and X-Ray against dozens of humans in Chicago who had been powered by the Wellspring of Power. He fired quills at various attackers. Porcupine and his allies quickly grew overwhelmed and looked to Doctor Octopus for leadership, and he ordered them to retreat. (Thunderbolts II#108) - Porcupine was with many of the world's superheroes and villains who surrendered their powers to the Over-Mind, who passed them to Baron Zemo in order to balance out the Wellspring. The situation was soon resolved and the superpowers returned. (Black Panther V#12 (fb) - BTS) - Through an arrangement with Dr. Doom, and in partnership with the mysterious Broker, Walter Declun hired several criminals, including Porcupine, and gave them technological updates to their powers. They then stationed themselves on the Broker's island and waited for their command. (Black Panther V#11) - Dr. Doom ordered Walter Declun to prepare his army for battle. (Black Panther V#12) - As the Wakandan ship containing the Black Panther (Shuri), the Fantastic Four (Human Torch, Mister Fantastic, Thing), and the Sub-Mariner attacked the island, the Mandroid blew the ship up. 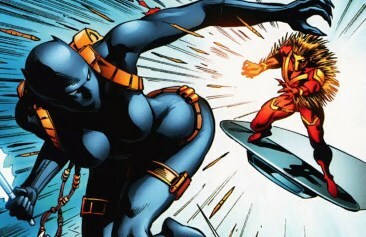 During the ensuing battle, Porcupine, aboard a flying disc, hit the female Black Panther with a series of deadly quills, but she quickly knocked him out with an energy truncheon. (Doomwar#5) - Still working for Declun Porcupine, Rock and Absorbing Man guarded the Palenque Ruins in Mexico against Fantastic Four members Human Torch, Invisible Woman and Thing, who had come there in search for the Vibranium stolen by Doctor Doom and to find Doctor Doom himself. (Doomwar#6) - Despite the support of Doombots the three Fantastic Four members did not have much trouble fighting Porcupine, Absorbing Man and Rock. (Doomwar#6 - BTS) - Porcupine, Absorbing Man and Rock were easily defeated and the three Fantastic Four members rejoined Mister Fantastic and Black Panther in their ongoing battle against Doctor Doom and his forces in Wakanda. (Captain America VI#11 (fb) – BTS) – Gocking entered the witness protection program with a new identity. (Captain America VI#11) – Even though he was in his civilian identity, Gocking was targeted by Scourge, but Captain America protected him. (Captain America VI#13) - Roger Manning ended his shift at the Baltimore Shipyards and was on his way home when Captain America suddenly appeared and tackled him to save him from Scourge's gunfire. (Captain America VI#14) - Captain America told Roger to stay hidden in a container while he drew out Scourge and took him down. (Avengers Arena#7 (fb)) - Porcupine attended Arcade's birthday party. (Superior Foes of Spider-Man#3) - Porcupine attended a support group meeting alongside Mirage, Dr. Bong, Boomerang, Hippo, and others. (Superior Foes of Spider-Man#11) - Porcupine attended a support group meeting alongside Dr. Bong, Hippo, Grizzly, Looter, and others. (Avengers Undercover#2) - Eel hung out at The Hole in Bagalia. (Ant-Man Annual I#1 (fb) ) - Months ago, Porcupine sought to rob an armored truck but was defeated by Ant-Man (Lang) and Giant-Man (Pym). (Spider-Woman V#8 (fb) - BTS) - Olivia moved Kalie to Moon's Hollow and began blackmailing Roger to give him proceeds of his criminal dealings. (Spider-Woman V#5) - Porcupine committed a robbery and was stopped by Spider-Woman (Jessica Drew), but he told her his child's life was in danger, and she agreed to help him. (Spider-Woman V#6) - Porcupine was kept chained to Spider-Woman's radiator while she checked out his story, then Ben Urich broke him out. Spider-Woman posed as Porcupine and allowed him to get badly beaten up by MAULER, Cyclone, Kangaroo, Big Wheel, Senor Suerte and Goldbug. (Spider-Woman V#7) - Porcupine and Ben Urich got pizza while Spider-Woman found the missing women, including Kalie and Roger's former girlfriend Olivia, in Moon's Hollow, NY, but when they arrived to investigate, they were apprehended by Cat. (Spider-Woman V#8) - Olivia released Roger and Ben Urich, then Spider-Woman defeated Cat. Olivia yelled at Porcupine for his frequent imprisonments and he was reunited with his daughter. (Spider-Woman V#9) - Spider-Woman, Ben Urich, and Porcupine solved cases across the country, battling Master Pandemonium, the Blue Man, and the Furious Five. Jessica berated Porcupine for his lack of instincts and penchant for getting into danger. Remembering how he wanted to be a sheriff as a kid, Roger drove them to Dodge City, where mind-controlled locals captured them; Porcupine was seemingly killed, shot in the chest. (Spider-Woman V#10) - Porcupine, having survived due to the durability of his suit, knocked out the gang with knock-out quills, then found Ben Urich wounded. Getting Urich medical help, Porcupine realized the locals were being mind-controlled through meat processing, and he found that CEO Carson Dowling was behind it. Roger stopped Dowling and stopped the mind control. Later, Spider-Woman left them to deal with the final incursion. (Spider-Woman VI#1 (fb) - BTS) - Spider-Woman became pregnant. While being sidelined by Ben Urich, she focused on helping Porcupine become a better super hero. (Spider-Woman VI#1 (fb)) - Porcupine hunted down Tiger Shark. (Spider-Woman VI#1) - Porcupine single-handedly defeated Gibbon, Griffin, Shriek, and Ruby Thursday. Spider-Woman announced her maternity leave with a large party attended by Kalie Gocking, Olivia, Bertie Puig, Sharon King, Cat, Lyla Bray, A-Force, Howard the Duck, and others. 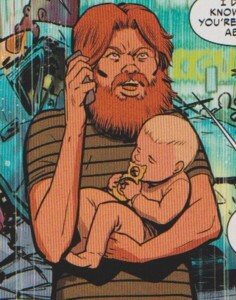 (Spider-Woman VI#5) - Porcupine babysat Gerald Drew, newborn, so Spider-Woman could go out, and he surprised her with how efficient he was and gave her advice on parenting. Meanwhile, he kept working with Ben Urich on cases. (Spider-Women Alpha#1) - Porcupine babysat Gerry while Jessica went out with her friends Spider-Woman (Gwen Stacy) and Silk. (Spider-Woman VI#7) - Porcupine watched Gerry for a few days until Jessica found her way back from Earth-65. She found Jesse Drew (her male counterpart from Earth-65) there posing as her brother. (Spider-Woman VI#8) - Porcupine tended Gerry until Spider-Woman got home from battling Tiger Shark. Roger made pancakes. (Spider-Woman VI#9) - Porcupine went with Spider-Women, Ben, and Gerry to Canada on a case/vacation. They came across a cafe where a Wendigo was carving up and serving human flesh to patrons. Porcupine battled several Wendigos before Spider-Woman and Captain Marvel defeated them. (Spider-Woman VI#10) - Porcupine helped Spider-Woman arrest Melter from the Quiet Room, then helped her stop Dr. Rot from creating pig warriors. (Spider-Woman VI#11) - Hearing about Spider-Woman's distress over the death of the Hulk at the hands of Hawkeye, Porcupine convinced her to follow her heart and take action. (Spider-Woman VI#12) - Spending the day at the beach with Spider-Woman, Gerry Drew, and Kalie Gocking, Porcupine ended up battling Sandman, taking a beating briefly before he defeated Sandman, heating him into glass. Katie hugged her dad, proud. (Spider-Gwen II#14) - Roger, Jessica, and Gerald visited Earth-65 on Thanksgiving to see Spider-Woman (Gwen Stacy). Roger marveled at his first time on an alternate Earth. When they heard the Koala Kommander from Australia was attacking, Roger and Jessica went off to fight him. (Spider-Woman VI#13) - Porcupine placed himself among other villains for the first time in months, including Ringer, Beetle, Hitman, Unicorn, Bruin, and new costumed villains in the uniforms of Mockingbird, Diamondback, Cutthroat, and Viper. (Spider-Woman VI#16 (fb)) - Porcupine met with Hobgoblin, who was flanked by his army (Blaze, Bruin, Unicorn, Gibbon) with the Tinkerer nearby. Porcupine tried getting out of his contract, wanting to embrace a new life as a hero; Hobgoblin shook on it, but later sent his army to attack Porcupine. 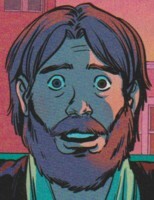 (Spider-Woman VI#13) - Later, with Ben Urich, he confided how he was finding more trust in Spider-Woman's life, and he admitted he was in love with her but didn't want her to know. Just then, as Ben hid, Hobgoblin's army attacked, beating him up badly for breach of contract, and then detonated a pumpkin bomb, seemingly killing him. (Spider-Woman VI#15 (fb) - BTS) - Roger survived the explosion by using a force field under his costume that he had found at Jessica's place. He shaved, stayed in the shadows, and followed Jessica to see when he could help. (Spider-Woman VI#15) - Roger revealed himself, helping Jessica fight Ringer, Beetle, Unicorn, and Bruin. Jessica surprised Roger by passionately kissing him, then Hobgoblin attacked, pulling Roger into the air. (Spider-Woman VI#16) - Spider-Woman and Porcupine sparred until Jessica unmasked her as a woman. Learning Hobgoblin was behind recent events, Jessica sped off but was attacked by Hobgoblin and his army (Ringer, Unicorn, Bruin, Beetle). Roger revealed he was alive, coming to her aid outside of his costume, having shaved and survived the explosion by using a personal force field under his costume. Jessica kissed him passionately, then Hobgoblin grabbed Roger, flying into the air. (Spider-Woman VI#17) - Spider-Woman hosted a party for her friends, including the Avengers, Nick Fury II, Howard the Duck, Becky Clyde, and Ironheart. Porcupine won them over when he risked his safety to save Gerry Drew, whose spider-powers had activated. (Spider-Force I#1) - Roger was being webbed by a busy Gerald when Scarlet Spider (Kaine) showed up to recruit Jessica for a mission. Comments: Created by Justin Gray, Jimmy Palmiotti, and Khari Evans. 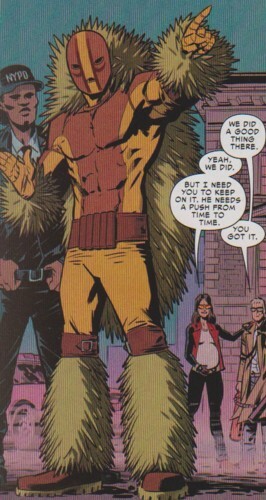 Gray, Palmiotti and Evans created a successor to Alec Gentry's Porcupine in Daughters of the Dragon#3. 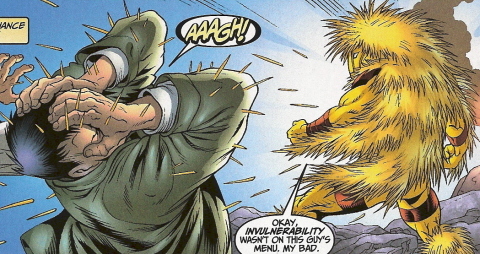 However, since another unidentified Porcupine had appeared in Sensational She-Hulk#59, some time after Gentry's demise, editorial subsequently approved merging the two characters to have a single Porcupine successor. 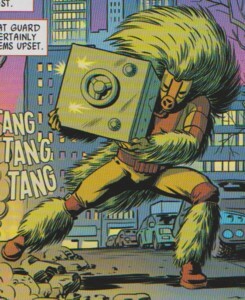 The She-Hulk's Porcupine was created by Len Kaminski, Scott Benson, Patrick Olliffe and Steve Montano. His real name was revealed in OHOTMU A-Z HC12's Thunderbolts entry.